In the days leading up to D-Day, Winston Churchill finds himself at odds with his military leaders. There's a section in the otherwise misfiring Maggie Thatcher biopic The Iron Lady set during the 1982 Falklands conflict that elevated that movie for a few minutes and made me wish the entire narrative had focussed on that one period rather than adopting the standard 'cradle to the grave' approach. Perhaps director Jonathan Teplitzky and writer Alex von Tunzelmann shared my frustrations with that Meryl Streep vehicle, as their Churchill biopic narrows its focus to the days leading up to the D-Day offensive of June 6th 1944. 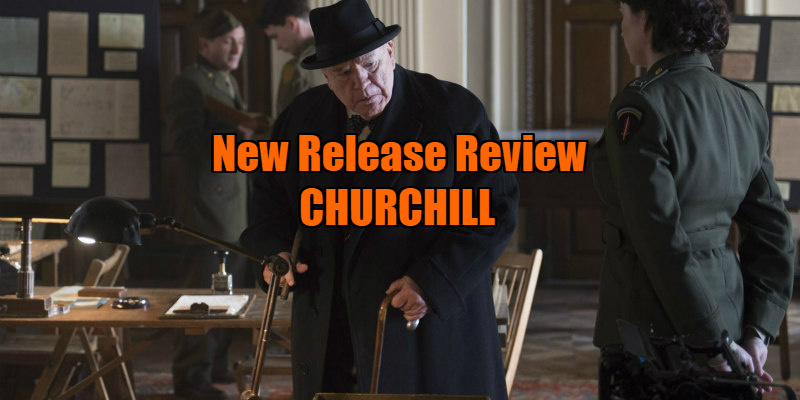 Having led his country through some of its darkest moments in the early years of World War II, Winston Churchill (Brian Cox) now finds himself becoming increasingly irrelevant, as the military men under his command, led by American General Dwight D Eisenhower (John Slattery), call the shots in a war beginning to turn in the allies favour. Summoned to a secret meeting attended by Eisenhower, King George VI (James Purefoy) and Field Marshall Bernard Montgomery (Julian Wadham), Churchill learns of the plans to launch a massive assault on the beaches at Normandy, one involving an unprecedented number of soldiers. Haunted by his role in the mass slaughter at Gallipoli in the previous war, Churchill voices his vehement opposition, convinced that the casualties will be too heavy to justify such an operation. Anyone who has seen Rocky III will be familiar with the narrative that follows, as Churchill's colleagues and his wife Adrienne, sorry, Clementine (Miranda Richardson) attempt to convince him that the operation is the Allies' best chance to finally defeat the Nazis. Like The King's Speech, Churchill focusses on its protagonist's attempt to prepare himself to address the nation, unknowing whether the news he breaks to the British public will inspire celebration or commiseration. But in reducing the other players in this historical drama to mere moons orbiting Churchill's presence, there's a notable lack of conflict and drama here, aside from a few passive aggressive arguments with Clementine. At times I was left pondering whether the movie may have been more interesting as a one-man drama along the lines of Robert Altman's Nixon rant Secret Honor. Churchill was the first world leader to embrace the new media of the twentieth century, exploiting the power of a rousing speech and a symbolic visual (his two finger V salute suggests he would have made a great filmmaker, such was his command of economic imagery). His image is so ingrained in popular culture that it would be futile for an actor to attempt a physical imitation, so it's refreshing to see Cox refuse to deliver such an impersonation. Resembling Churchill neither physically nor aurally, Cox's performance takes a few minutes for us to settle into, but once you accept the brave choice made here by the actor, you're left in no doubt that you're watching anyone but Winston Churchill. It's this turn by Cox that holds our attention in a movie that otherwise offers scant rewards with a presentation that perhaps would feel more at home debuting on TV on a Sunday evening. 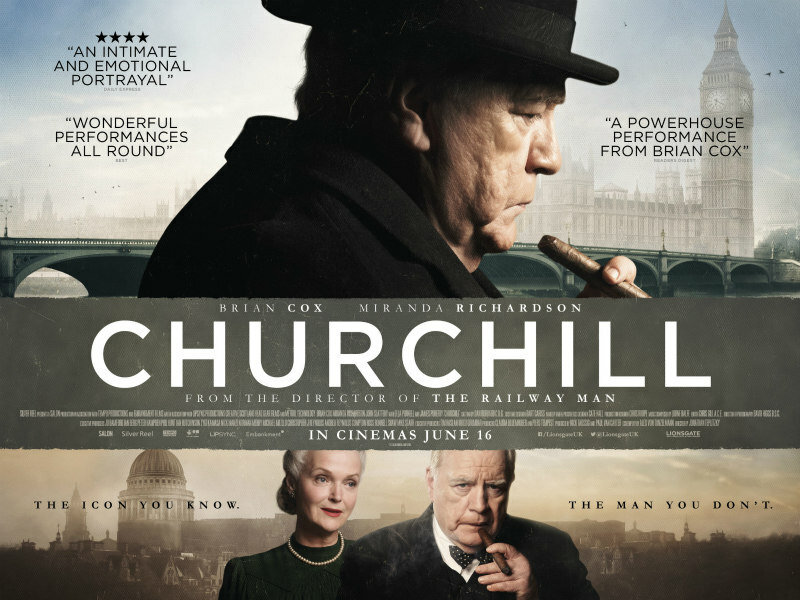 Churchill is in UK/ROI cinemas June 16th.